The Pioneer DJ DDJ-1000 is a professional 4-channel DJ controller perfectly tailored to Rekordbox DJ software. 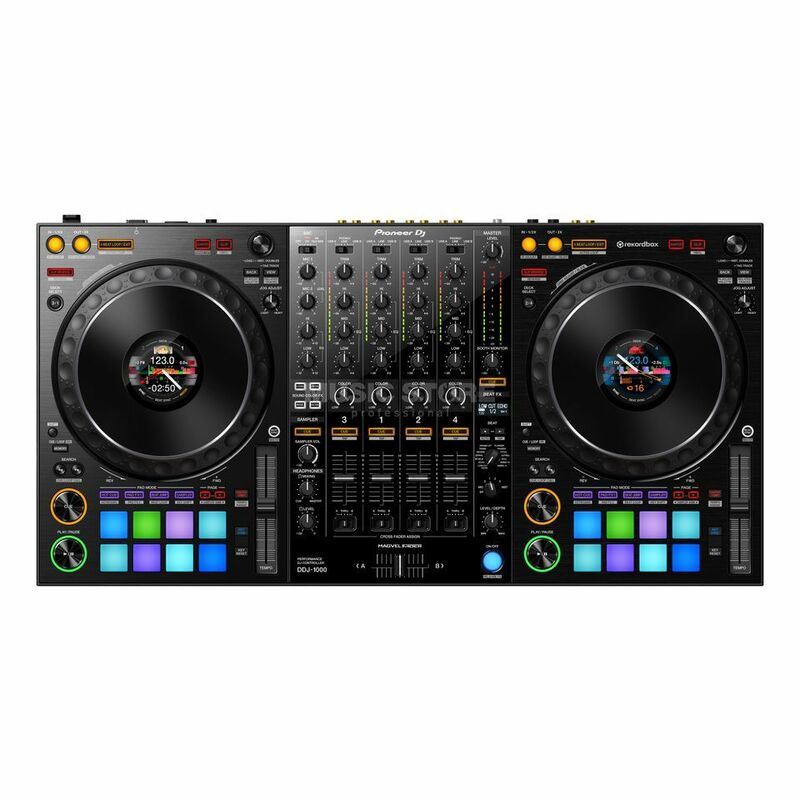 This portable DJ controller appears in a club-style layout and delivers various professional features, such as full-size jog wheels from the CDJ-2000NXS2 with colour on jog displays for a quick overview and accurate performances. In addition to 14x beat FX with new additions, 16x multi-colour performance pads for hot cues, pad FX and keyboard mode are on board. An improved Magvel crossfader and many inputs and outputs for different setups complete the toolset of the Pioneer DJ DDJ-1000. The license key of the software is closely connected to the hardware and can only be registered once! Since the software can therefore not be transferred to a new buyer, we can unfortunately not grant the usual 30-day right of return after registration of Rekordbox DJ. Since your satisfaction is very important to us, we have a solution for you: Please use the unrestricted test version of Rekordbox DJ, valid for 30 days, which you can download and install from the Pioneer DJ website. This way you retain the 30-day right of return when purchasing. The DDJ-1000's controls are placed for a familiar club feel, just like a standard NXS2 club setup. Even the large jog wheels come from the popular CDJ-2000NXS2 DJ player and can be operated in the same way. Therefore, the interaction of the Controller and the included Performance DJ software Rekordbox DJ gives you the same performance experience as if you were playing with an NXS2 setup and USB storage media. Thanks to the coloured, high-resolution LCD display in the middle of the jog wheels, there is no need to look at your laptop for information during performance. The display spits out all relevant information such as playback time, waveform, playback position as well as hot cue and loop points. You can adapt the displayed information to your needs. The Pioneer DJ - DDJ-1000 features 10x familiar beat FX from the DJM mixer series, plus 4x additional effects. With the Beat FX display, you can instantly see the reference BPM and the name of the selected effect without having to look at your laptop. The 4x other effects are: Enigma-Jet, Mobius-Saw and Mobius-Triangle, which are reminiscent of endlessly rising or falling sounds, and the Low-Cut Echo-FX, which cuts off the low frequencies of the echoes. The DDJ-1000 is equipped with an optimized, extremely robust Magvel fader crossfader, which is based on the design architecture of the well-known Magvel Fader Pro from the professional mixer DJM-S9 (with over 10 million control movements). The improved Magvel Fader combines optimal performance possibilities with very welcome lightness. In addition, latency has been further reduced by improving the software-side jog wheel and crossfader data. With the help of the 2x USB ports for PC/Mac, smooth DJ changes are possible for Rekorbox DJ users. The DDJ-1000 also features a stand-alone DJ mixer equipped with inputs for 4x external devices such as DJ players and analogue turntables, as well as 2x microphones. Additional equipment shown is not included in the scope of delivery!